The first book in the Harry Belltree series Crucifixion Creek (reviewed here) signalled a change of pace and setting for Australian crime writer Barry Maitland. He forsook his long running very British Brock and Kolla procedurals for the faster paced, more morally ambiguous Belltree. At the same time replacing the more staid and cool streets of the UK with the brashness and bright sunshine of Sydney. It was a brave move and it paid off. Crucifixion Creek was a great piece of Australian crime fiction, involving shonky developers and bikie gangs in Western Sydney it garnered a nomination for the Ned Kelly Award for Best Crime Fiction in 2015. But there was always a deeper story at play connected to the death of Belltree’s famous father, a member of the stolen generation and the first Aboriginal judge of the New South Wales Supreme Court. The second book of the series, Ash Island (reviewed here), also made the Neds short list in 2016. Ash Island broadened out the conspiracies only glimpsed in the first book and provided more clues to the mysteries surrounding the death of the Belltrees senior. But the story suffered a little from middle book syndrome, raising more questions than it answered and once again leaving readers hanging. When Slaughter Park opens, Belltree, no longer works for the police and has gone to ground. He is brought back into the fray by reporter and friend Kelly Pool when his wife Jenny goes on the run wanted for murder. It turns out that the forces that Belltree had been fighting never rest and have kept plotting and scheming while he has just been trying to move on. At the same time, body parts tied in pink ribbon are turning up at Slater Park in Sydney’s inner-west, quickly renamed Slaughter Park by the media. The murders increase community anxiety and put pressure on the government to bulldoze the lot and redevelop the area. It is no surprise to find some of Belltree’s antagonists involved. Once again, Maitland has thrown in everything you would want from an Australian crime novel, particularly one set in Sydney: greedy developers, corrupt police, compromised media, shonky politicians, bikies, illegal dog fighting and drugs. But also, in the ongoing mystery, issues of Aboriginal identity, and in particular the stolen generation also get a look in. And Harry Belltree is the perfect guide to this world. While he has some sense of justice, he is resourceful, well trained by the army and never afraid to do questionable things to get what he needs or where he needs to go. But he is not always the centre of this book. Maitland builds tension by also dropping in on other characters such as Harry’s resourceful wife Jenny, journalist Kelly Pool and Deb Velasco, possibly one of the only uncorrupted cops left on the force. It would be advisable to read the Belltree books from the beginning and in order. 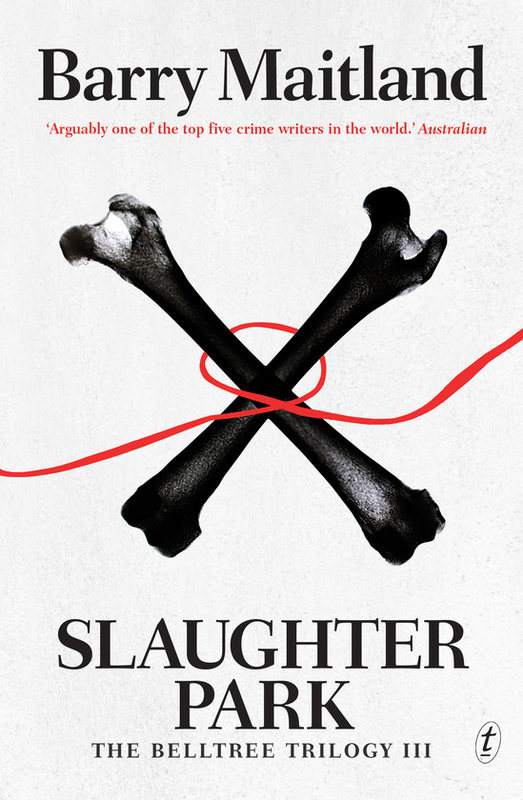 While this book and the previous volumes have had a self-contained mystery at their heart, Slaughter Park has been written as part of a trilogy and is organically linked to the previous volumes. And as the pieces fall into place it is clear that Maitland has had tight control on his overarching plot from the beginning of this series so that Slaughter Park is both a compulsive and satisfying conclusion.